Everything about this dish cries out comfort. The creamy coconut, soft potato, even the chilli heat brings a certain loving warmth to your mouth. Definitely one for eating on the sofa, with a fluffy pile of white rice,and a good book. 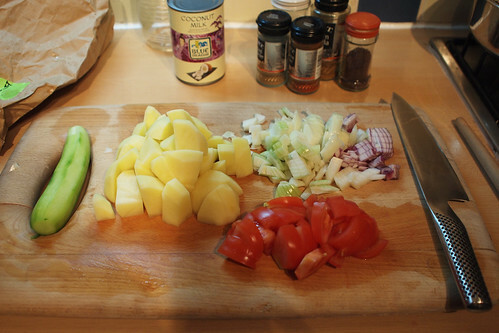 Curry is one of my standard fall back midweek dishes when I want something simple, tasty and not too labour intensive. And this is certainly straightforward. 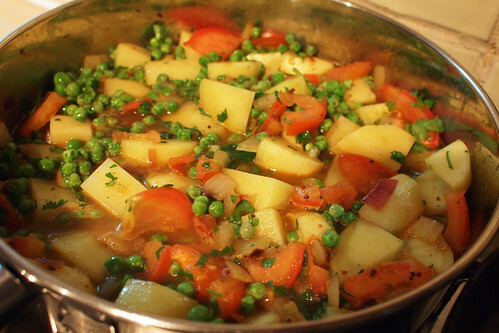 It’s an evolution of one of my standard veggie curries – spicy potato, pea and tomato. I have added coconut milk and tweaked the spices. There is no asfoedita – one of those spices that adds a pungent something to dishes, like fish sauce in SE Asian cooking – or nutty cumin. Instead, garam masala and ground coriander make it more richly aromatic and lend an underlying spicy warmth. The end result is very different. The tongue tingling excitement and spicy melody of the original dish is gone. The coconut milk gives it an underlying creamy sweetness and the garam masala a rich aromatic edge. This is more of a duvet dinner, soothing and soporific. Because you don’t want everything you eat to jump up and down demanding your attention. This is partly an evolution of a potato curry I cook a lot (but don’t seem to have blogged yet) and partly inspired by a South Indian potato curry I found when flicking through Curry Easy by Madhur Jaffery looking for some inspiration. As always I went flying off on a tangent. But it turned out to be a pretty tasty tangent. Heat a couple of tablespoons of oil in a pan over a high heat and chuck in the chilli flakes and mustard seeds. When the seeds begin to pop, turn the heat down to medium, add the onion and stir and fry for about 2-3 minutes. Add the potatoes and stir for another minutes, then add the chopped tomato, peas, garam masala, ground coriander and a little salt. Stir well for another minutes and pour in the water. Bring to the boil, turn the heat down low, cover and leave to simmer for 20 miuntes. Add the coconut milk, stir until it is heated through – another couple of minutes – stir in the coriander and serve with rice. I love curries but I don’t feel confident messing with them as I’ve only spent a day or two in an Indian kitchen, but I can follow a recipe! I also have some parathas languishing in my freezer that I bought ages ago and haven’t had anything to pair with. I’ll make this, forwith! 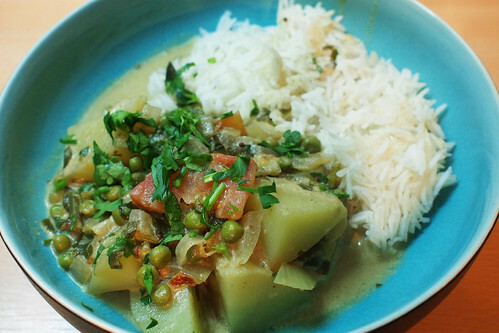 We had the potato and pea curry from Curry Easy last night, along with Madhur’s okra dish and her pineapple raita. All excellent – the raita in particular was a standout dish. My first time cooking from the book, but I suspect it’s going to become a standard in my kitchen. @Sasa – I started playing with curries a few years ago, and it is amazing, so long as the spicing is right, how easy and forgiving they are. They tend to be pretty quick to make as well. You should totally go for it. I would recommend Curry Easy by Madhur Jaffrey or her Ultimate Curry Bible as great starting points. @NickyB – I love that book, it’s rapidly turned into one of my top go-to books for a simple and tasty dinner. Just wondering if you ever spinach or chickpea this one up. That said, the latter might be a bit too much if you’ve already got spuds in it. @Mr Noodles – heh If I was going to add spinach, i would probably omit the coconut milk, and chop the spinach up when I cook it. That way it becomes something of a green paste and adds that wonderful deep earthy spinach taste. I’d also definitely add cumin seeds as well. Looks lush, I’d up the chilli flakes a wee bit but I bet this would be fantastic with a couple of Chapati’s! Ok this is TOO weird! I’m just blog surfing right now and first went to @NotQuiteNigella’s blog – candy potato. Then I went to @ScandiFoodie’s – potato tart. And then your’s! POTATO CURRY! Is there something going on that no one’s telling me about?! Are potatoes the NEW BLACK???? @Paul – thanks! You could add some fresh bird’s eye chilli I reckon, or maybe a half teaspoon of cayenne. Both would be pretty good for the heat. Now the next thing I need to do is learn myself how to make chapatis. I also love potatoes in curry, well in anything where it can absorb so much interesting saucy flavours. Mmm-mmm. And isn’t everything like this better on day two?